In a circuit, a parallel combination of two 20-Ω and one 10-Ω resistors is connected in series with a 4-Ω resistor. 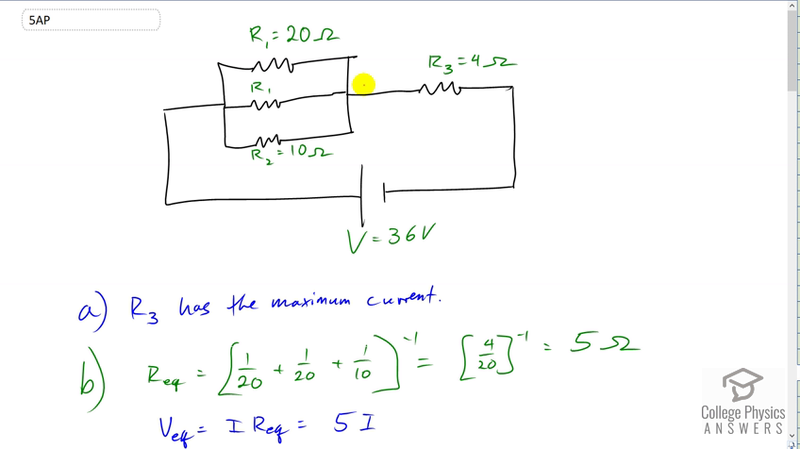 The source voltage is 36 V.
Find the resistor(s) with the maximum current. Find the resistor(s) with the maximum voltage drop. Find the power dissipated in each resistor and hence the total power dissipated in all the resistors. Also find the power output of the source. Are they equal or not? Justify your answer. Will the answers for questions (a) and (b) differ if a 3 Ω resistor is added in series to the 4 Ω resistor? If yes, repeat the question(s) for the new resistor combination. If the values of all the resistors and the source voltage are doubled, what will be the effect on the current? $R_3$ has the maximum current. Each of the resistors connected in parallel have the maximum voltage drop. This is College Physics Answers with Shaun Dychko. We have a circuit with a parallel combination of a two 20 ohm resistors and with a ten ohm resistor. That combination is in series with a four ohm resistor. And so I’ve called these two R1. This is R2 and this is R3. And there’s an EMF of 36 Volts. So the first question is which resistor has the maximum current? And that’s definitely R3 because the current that goes to R3 is total current in the circuit. And that current gets split up in three branches here. And so, definitely each of these resistors gets only partial of total current and then it recombines here. And all of it goes to R3, so R3 has the maximum current. The next question is, find the resistors with the maximum voltage drop. Well, each of these three resistors would have the same voltage drop because they are in parallel. And so we’re going to compare the voltage across this combination with a voltage across R3. So we need to find the equivalent resistance of these three first and we’ll call it Req for equivalent. It is one over 20 plus one over 20 plus one over ten, all to the negative one. And that’s four over 20 to the negative one which is five ohms. And so the equivalent resistor voltage is five times the current ‘coz it’s the current times equivalent resistance. And the voltage across the four ohm resistor is labelled R3. That is going to be the current times R3. And that’s what is going to be four times the current because its resistance R3 is four ohms. And so because the equivalent resistance is five ohms, it’s greater. It’s going to have a larger voltage drop across it. So each of the resistor connected in parallel have the maximum voltage drop. They tie, all three of those. Part c is find the power dissipated in each resistor and find the total power dissipated in the whole circuit. And then find the power output of the source. So, we need to know what is the current through each resistor. And so the total voltage of the circuit is going to be the total current times the total resistance of the entire circuit. So that’s the equivalent resistance of the three resistors in parallel plus the single resistor in series. And it will solve for I by dividing by this bracket on both sides. And we get I as V over the Req plus R3. So that’s 36 Volts divided by five ohms that we already figured in part b plus the four ohms of R3. And this gives four Amps. So, the voltage across the three resistors in parallel is going to be that current multiplied by the equivalent resistance of the three. So that four Amps times five ohms which is 20 Volts. And now that we know the voltage across each of those resistors in parallel, we can figure out the power dissipated in each. And so the power for the 20 ohms resistor is going to be that voltage across the three in combination squared divided by 20 ohms. So that’s 20 Volts divided by 20 ohms which is 20 watts. And then across the ten ohm resistor in the parallel combination, that’s 20 Volts divided by ten and we squared the 20 Volts. And that gives 40 watts. And the power across the four ohm resistor is the current through that squared multiplied by the four ohms. So that’s four Amps squared times four ohms which is 64 Watts. Now the total power dissipated by each of these four resistors is going to be two times 20 watts, because there are two 20 ohm resistors. And then plus the 40, plus the 64 which is 144 watts. Now the total power output of the source is the voltage of the source times the total current. So that’s 36 Volts times four Amps which is also 140 Watts. And the total power dissipated by the resistor is equal to the total power output of the source. And we expect that by conservation of energy. Then in part d, we’re told, let’s introduce a three ohm resistor in series with this four ohm resistor. And what changes would that make to our questions a and b? And the answer is no change, because these resistors have an equivalent resistance of five ohms. This addition will reduce the total current in the circuit. But it won’t change how the different resistors compare. Whatever that current is. By the putting this resistor there you’ve reduced the current. And this equivalent resistance is still five ohms. And so these will still have the maximum voltage across them so part b will not change. Because whatever the current is, the voltage across these three guys is going to be the current times five ohms. And then this will have, the voltage across R3 will be current times four ohms. And voltage across R4 will be current times three ohms. So this is the maximum voltage. And the resistors with the maximum current will all be a tie between this one and this one. So, you can still say that R3 has the maximum current and so there’s no change there either. And then part e, if all the resistors and source voltage are doubled, what would be the effect on the current? Well, the current we found the formula for it here. That’s voltage divided by resistance of the three resistors in parallel plus R3. And so I’ve written that here. And the equivalent resistance of the three resistors in parallel is two over R1 because there are two 20 ohm resistors plus one over R2 all to negative one. We got a common denominator R1 times R2, and a numerator R1 plus R2. Then take the reciprocal of that, you get R1 times R2 over R1 plus R2 plus R3. And this is the current initially. Then, we write that formula again, but substitute two times voltage and two times each of the resistances. And then, this term here we have two times two making four times R2 times R2 over this two. They could factor that out as a denominator. And this works out to two R1R2 over R1 plus R2. And so this denominator here has a common factor two that’s going to be factored out. And we can see that these two is cancel. And we have V over R1R2 over R1 plus R2 plus R3. And that is what I1 was. And so that makes no change.